Best wedding designers | Elite Club, Ltd. This article was written on 08 Sep 2014. It is hard to imagine that there was time when bridal industry did not exist. Actually, it was so before 1950. Now it is a 70 billion dollar industry that attracts the best specialists in their spheres to make the special occasion of your life magnificent. Elaborate wedding gowns represent trends and fashion styles and, certainly, take the special place in this industry. Every bride dreams of the most beautiful wedding dress. Popular wedding designers try to meet the demands of every woman on a special day of her life. Here is the list of the best wedding designers that contributed greatly to make wedding fashion a real art. Romantic and sensual gowns for wedding can be discovered in Elie Saab collection. The designer of Lebanese origin likes to accentuate woman’s silhouette and adorn wedding dresses with intricate details and delicate embroidery. She uses luxurious materials for that. 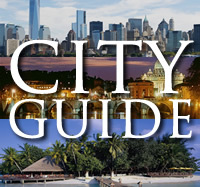 Among her famous clients are Angelina Jolie, Halle Berry, Beyonce and others. Vera Wang is a famous New York fashion designer. Her haute couture clothing is highly demanded: ladies like her wedding gowns while the rest do not mind wearing bridesmaid gowns from this well-known designer. 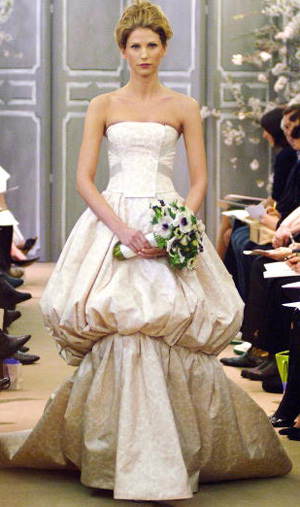 Vera Wang dressed many celebrity favorites for wedding and red carpet events. For instance, she made a wedding gown for Hilary Duff, Chelsea Clinton, Alicia Keys, Victoria Beckham, holly Hunter, Uma Thurman and etc. 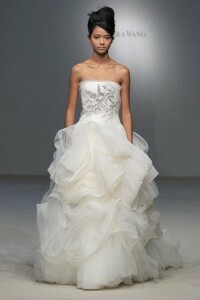 Oscar de la Renta creates wedding gowns for ladies with strong sense of femininity. This preeminent fashion designer was born in Dominican Republic. The couturier dressed Jacqueline Kennedy in the 60-ies. Oscar de la Renta makes attires for red carpet celebs and members of royal families. The brand Oscar de la Renta is known internationally. He has many awards and honors and receives continual recognition all over the world. Oscar de la Renta offers wedding gowns appliqued with hand-cut flower motifs, layers of pleated tulle and pearl embroideries in different variations. Wedding gowns from Monique Lhuillier are amazing. The diversity of models is big so every bride can find the dress to her taste. Sweetheart necklines, drapes of beautiful fabrics and extraordinary embroideries contribute to romantic dresses and make the woman feel great. By the way, this is a motto of Monique Lhuillier. He has been always created attires with this thought in mind as he admitted in the interview: to make the woman feel her best. 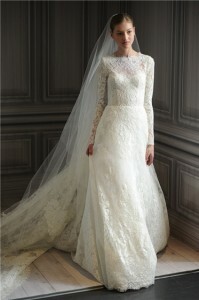 If you want to feel that in your wedding dress, pay attention to the wedding collection of Monique Lhuillier. Carolina Herrera is a designer of Venezuelan origin. Her wedding dresses are impressive but you never find fuss in them. 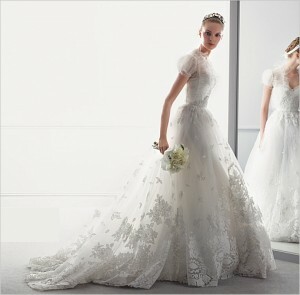 The wedding gowns from Carolina Herrera are elegant and superb. Вру remembers an interesting fact from her biography: her grandmother took her to the fashion shows and bought clothes of the best brands for her. Carolina Herrera has many awards and is known for dressing First Ladies. Jacqueline Kennedy was her client. Since that time the designer’s works are highly appreciated in the White House. Marchesa is a New York brand that was established by Keren Craig and Georgina in 2004. The company creates high-end women’s wear including fantastic wedding gowns. Any bride will look excellent in them. Many celebs like to wear Marchesa on wedding occasions and other notable events. Gorgeous wedding dresses from Allure Bridal can make the most important day of your life incredible. You will look your best then! The most exquisite gowns in traditional style are enhanced with modern twists. The woman looks special on her wedding celebration. What can be better than this?